Last time we previewed the Mets, it was on the eve of the 2016 postseason. With most of their starting rotation hurt, it wasn’t as strong a team as had made it all the way to the World Series the year before, but we liked their chances against the self-immolating Giants in the wild card play-in game, especially with home-field advantage. Their season ended one game later. Since then, their biggest move has been re-signing a guy who was on the team last year. Seriously, the 2017 media guide lists “New Mets” for the season as “None.” They might still get some speed and youth into the lineup in the form of call-ups, but there is a reason the Mets think the same roster will yield different results. Basing sports prognostication on potential injuries is meaningless almost to the point of existential doubt. Of the 30 MLB teams, probably 20 of them expect to contend under ideal circumstances. With all apologies to this form, the long season will likely be determined by fluke or funk or injury. To say the Mets will be good if all their best players stay healthy, and not if they don’t, makes me worried about the future of baseball analysis. 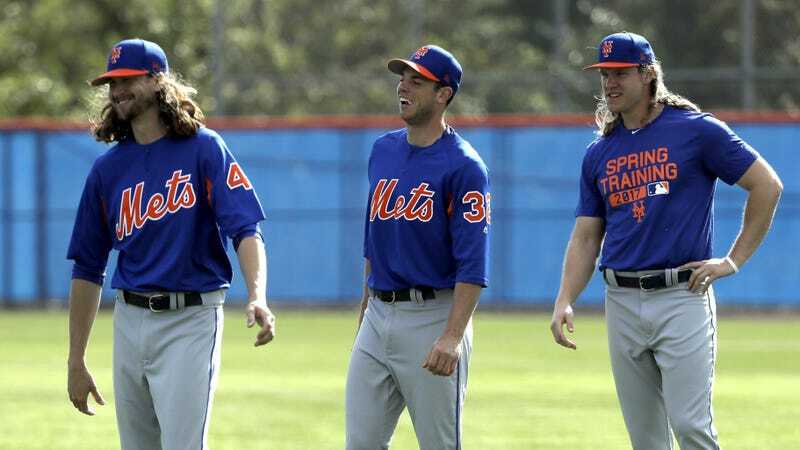 But their sheer lack of offseason action is a testament to just how confident the Mets are that this is a World Series-caliber team—if only they can keep the talent on the field. The looming fear of injury applies predominantly to the rotation, but if the Mets’ World Series aspirations seem especially urgent, it’s not because of the gaggle of 20-something starters. After two-straight seasons appearing in fewer than 40 games, David Wright is already scheduled to start 2017 on the DL. The 34-year-old team captain—and one of the few remaining single-team All-Stars—has aged about a decade since he started nursing a nagging neck injury...which cause him to switch up his motion...which is why he’s now sidelined with a shoulder situation. At this point it’s almost irresponsible not to replace Wright with something more permanent than a platoon of Jose Reyes and Wilmer Flores so if the Mets want to give their franchise player a World Series ring while he still has a right arm connected to his body, they’ll need to win relatively soon. Speaking of players the Mets should be embarrassed to employ, Jeurys Familia will likely miss at least the first month of the season after MLB finally gets around to handing down his domestic violence suspension. Before he gave up the three-run ninth-inning dinger that cost the Mets their 2016 season, Familia converted an MLB-best 51 saves. So even though his presence is an uncomfortable reminder that professional sports haven’t figured out how to handle accused abusers—especially ones without a criminal conviction—his absence will leave the back end of the bullpen floundering for some time. There’s also going to be a Bartolo Colon-sized hole in the hearts of fans who like to believe that a little extra jiggle around the middle means he’s basically Bob from accounting. (He’s not. The man is playing professional sports at 43 years old.) But—here come the conditions—if all goes according to plan, Colon’s departure will serve to open up a rotation spot for one many of the qualified options that the Mets have finally nursed back to health. Whatever happens to the Mets’ 2017 season, it will become part of a multi-year narrative about their commitment to an incredible, injury-prone core of young pitchers. In just his third season in the Majors, Noah Syndergaard is an easy choice for Opening Day starter. Nobody throws harder more consistently than the towering 24-year-old, who may have taken his own Norse god nickname to heart when he added 17 pounds of seemingly pure muscle to his 6-foot-6 frame this winter. His 2.60 ERA last year was good for third-lowest in MLB and—not to get ahead of ourselves—his two-year-old career has already included four postseason starts, over which he’s posted a 2.42 ERA. In fact, someone tell Syndergaard—who reportedly wants to throw harder and also lied about bone spurs last season—that he’s perfect just the way he is, and tell him quickly, before before he blows out his elbow. If Syndergaard’s health is to be trusted—and given the Mets’ history, nothing good is ever to be trusted—the season hinges upon the returns of four other one-time phenoms from various states of disrepair. Matt Harvey will return to the mound, minus the rib he sacrificed to alleviate thoracic outlet syndrome, for the first time since giving up on a terrible 2016 last July—although even that downplays just how touch-and-go he’s been since Tommy John surgery back in 2013. The Mets marketed Harvey with such a heavy hand that it’s easy to feel like he’s fallen short of his potential. At 28, he’s yet to crack 30 starts in a season, but his career ERA—which consists of parts of four seasons spread out of over five years—is still under 3.00, and they’re no longer expecting him to be the ace. His velocity has risen as the spring has gone on, so there’s reason for optimism. Jacob deGrom will be back in the rotation and hoping the surgery he had last September to address nerve pain in his elbow helps him return to his Rookie of Year (2014) or All Star (2015) form after a season of just slightly-above-par pitching. The fourth rotation spot would have easily gone to Nice Long Island Boy™ Steven Matz if he could get a handle on his goddamn bone spurs. It’s looking increasingly likely that he’ll spend Opening Day on the DL and the rest of the season uselessly swaddling his elbow in bubble wrap in an effort to crack 140 innings. Assuming he still remembers which direction to throw the ball after losing a full two seasons to a winding Tommy John recovery, Zack Wheeler will be back to make Mets fans say, “Oh right, Zack Wheeler.” With an innings limit hanging over Wheeler’s head, Terry Collins may find more use for him in the bullpen, leaving room for both over-performing 2016 mid-season call-ups (13th- and 34th-round draft picks, respectively) Robert Gsellman and Seth Lugo. Gsellman has reportedly clinched a starting role; it’ll come down to Wheeler and Lugo for the fifth spot. After finishing 2016 with the second-most home runs in the National League, the Mets are hoping to squeeze enough dingers out of an aging lineup to balance what could be the best rotation in baseball. This means bringing back Yoenis Cespedes, which is great, planning to start Jay Bruce over Michael Conforto, which is perplexing, and treating Curtis Granderson like a capable center fielder, which is wrong. One guy you do not need to know is Tim Tebow because if he makes the jump from A ball to the majors this year, it will be because the Mets are so far out of contention that everyone has stopped watching them. Disagree? I’d like to see your jawline at 67. Well that depends. You wouldn’t happen to have five adult-large plastic bubbles they can borrow, would you? 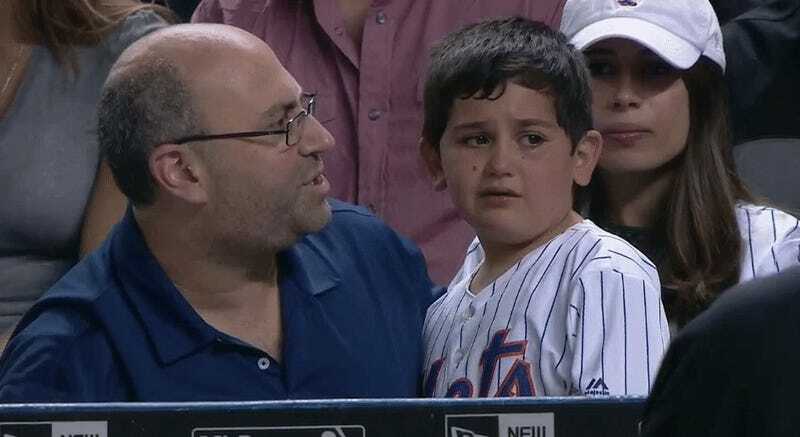 Why should you root for the Mets? Like last year, I won’t. So, like last year, I asked someone who will: my extremely dedicated Mets fan of a grandmother. She said you should root for them because they’re going to win it all if they can muster even a little bit of offense and also could I ask my husband if he likes veal.